Most stove companies have warnings on their backpacking stove instructions that only their brand of gas canisters should be used with their stoves. Really? A backpacking type canister of gas. Um, no. All of the threaded canisters (which at least in North America are all that are available anymore for backpacking type stoves) use a 7/16ths UNEF thread. They're all compatible with one another from the point of the mechanical connection, and gas is gas. There aren't any blends of canister gas out there that are incompatible with one stove or another. And besides that, there's a lot to suggest that all the major brands except Coleman are made by the same company in South Korea. A few years ago, I noticed MSR changed the shape of their canisters, the hue of their red color, and their caps instead of flat were more raised, had a more separated pull tab, and had a little hole and a square on top. The following year, Snow Peak Canisters, which had relatively flat caps with “Snow Peak” molded into them became… you guessed it, more raised, had a more separated pull tab, and had a little hole and a square on top, and whereas they had always been labeled “made in Japan”, they now were clearly labeled “made in Korea”. An old Snow Peak canister, left, and a new Snow Peak canister, right. Note how caps have changed and that the shape of the canister has changed subtly. Curious, I started looking at a number of different brands. They all had the same caps, and the canister shapes were all now the same. Gas canister from three major brands. All have the same shape. All have the same cap. I looked at Primus, Optimus, Olicamp, MSR, Jetboil, Brunton, Snow Peak, and Burton. All of these brands now had the same caps and the same canister shape, and all were made in Korea. The only exception I could find was Coleman which is made in France. It was pretty clear to me that whereas before there had been a diversity of canister caps, countries of origin, and canister shapes, there now was only one. They were now all being made by the same manufacturer. 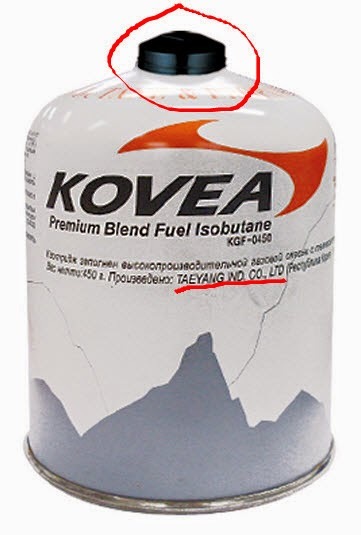 A canister of Kovea brand gas, clearly marked "Taeyang Ind. Co., Ltd.". Note canister cap. The cap? You guessed it, raised, with a little hole and a square on the top, and unlike many of the major brands who for whatever reason don’t want to let on (and I have asked, directly) who makes their canisters, Kovea prints it right on the side of the canister: “Taeyang Industrial Co. Ltd.”. So, pretty much all the major brands are actually manufactured by the same company. The blend of gas and the labeling may vary, but the physical canister is identical. Before, when there were a greater number of manufacturers, one could interchange canisters because of the 7/16 UNEF standard thread. Now, they are literally identical. Why do stove companies say to only use their brand? Well, to sell more canisters for one, but also for liability. If you use some other brand of canister and something bad happens, they can say in court, "well, we warned you not to use other brands of canisters." While it doesn't really matter which brand* of canister one buys, gas blends do vary. The composition of gas in a canister, typically some mix of propane, isobutane, and "plain" butane, doesn't matter too much in warmer weather, say no colder than 50 Fahrenheit/10 Celsius, but the colder one goes, the more the blend of gas matters. In cold weather, the general rule of thumb is to avoid butane and stick to canisters that have a propane-isobutane blend. Propane is generally the best cold weather fuel – but if it's mixed with just plain butane, avoid that brand. An isobutane blend, even if it contains less propane than another brand, is going to perform best in cold weather. For more on this subject see What's the Best Brand of Gas for Cold Weather?. The bottom line? Except in cold weather, just buy whatever is cheapest. *I'm speaking here of major brands in developed countries. China, for example, has many smaller manufacturers of gas canisters. Chinese canisters have reputation for leaky valves and for having impurities in the gas that can clog stoves. Many travellers simply refuse to buy Chinese made canisters even if they are the cheapest in a given area. Review: The Kovea Hydra Dual Fuel Backpacking stove. OK, so, what's all this about the Soto Amicus? I mean why all the fuss? There are dozens of upright canister gas stoves available out there. Primus, MSR, Optimus, Snow Peak, Jetboil, etc. – in short, all the major stove companies – have upright canister stoves out on the market, in fact, most of those companies have multiple stoves available. So who cares about just one more upright canister gas stove? Big deal. Yawn. Well, maybe. But maybe not. Maybe there's more to it than that. Let's keep reading, and we shall see. UPDATE 18 December 2017: My finalized Review of the Soto Amicus is now available. OK, so why am I excited? Well, I'll tell you. But rather than a long winded technical explanation, just watch this short, three minute video, and then let's go from there. OK, now did you see that in the video? The stove on the left, the Soto Windmaster, beat the stove on the right by almost a full minute. And did you catch what I said? The Windmaster won every time. And believe you me, I ran test after test after test. Due to the circumstances of my life, this stove, the Windmaster, is probably the most thoroughly tested of any stove I own. I had a job end a few years ago. I had been with the company for over 21 years, but they let me go. I hadn't looked for a job in a long, long time. The world had changed. There really wasn't much of an internet when I had last looked for job. Now I was a tech worker around 50 years old. There's a tremendous prejudice in the tech sector against older workers. I had three mouths to feed. I was desperate for money. When I had work, I would work as many hours as humanly possible. So, sorry stove hobby, but you're on hold. But of course I never stopped hiking during that time. Job hunting is the very worst sort of mental torture. My escape was to set aside one day per week for hiking. And I brought stoves. And on many of those trips, this rather intriguing Windmaster. So this stove is tested. OK, so, um, weren't we talking about the Amicus? Why are you going on and on about the Windmaster? Oh, right. Now, the Windmaster is actually the best upright canister stove available today in the US market (in my opinion) – and it isn't selling well. Why? Well for one, it's pretty expensive for an upright canister stove. At $75 MSRP, it's tough to sell stoves when one can just go get an MSR PocketRocket or a Snow Peak GigaPower for about $40. [Note: Campsaver* has the Windmaster and the Amicus for way less than MSRP]. Two, the Windmaster has a detachable pot support (easy to lose) which just about nobody likes. Three, the Windmaster is a pretty tall stove and doesn't fit into a lot of smaller pots. *Disclosure: I have no relationship whatsoever with Campsaver. I don't get a nickel for telling you about them. I'm just telling you because they've got a frickin' steal of a deal going on right now as I write this. Why am I excited? I'll tell you. Just look at the burner head. It has the same type of burner head as Windmaster. The recessed burner head of the Soto Amicus. Gone is the detachable pot support, and the MSRP is now thirty dollars less at $45.00. Now, that's a competitive price when you consider that the new MSR Pocket Rocket II (coming in 2017) also has an MSRP of $45 and the new JetBoil MightyMo has an MSRP of $50. Soto has finally gotten real with their prices. So, if this stove has significantly better features and wind handling properties than the competition, then I think that Soto could really go places with this one. I'll report more on that as I go through my review process. Stay tuned. The above video shows why I think the Soto Amicus has real potential. Soto really has developed a wind resistant burner technology. Will the Amicus be as good as the Windmaster? I honestly don't know. Yet. But I should have a pretty good some time later this year after I've taken it out into the field over the coming weeks. Stay tuned. The price is good ($45 MSRP with piezo* vs. $75 for their last stove). The weight is in range with the competition (about 2.7 oz/75 g) – and the Amicus has a piezoelectric ignition* whereas many of its competitors do not. Far more compact than its predecessors. Best in the business piezoelectric ignition*. Nobody even comes close to Soto's engineering here, not even close. Potentially outstanding wind resistance (I haven't completed my field tests yet, so it's just "potentially" at this time). Soto may have a real winner here. OK, enough discussion. I need to get out there and complete my field trials. *A version of the Amicus without a piezoelectric ignition is available for $5 less. The best in breed "Stealth" ignition of the Soto Amicus. Nobody else even comes close. No little ceramic doohickey to break. No unsupported, exposed wire constantly in the flame. No big plastic or metal thingy glommed onto the side of the burner. I just took possession of a new Soto Amicus, which is an upright canister stove, i.e. a stove that sits on top of a canister of gas. This is Soto's third upright canister stove introduced to the US market, and I'm thinking that this may be their strongest entry yet. We'll see. I have just started to evaluate the stove. So, first impression: It's small. Nice. I haven't measured it against my Soto Microregulator or my Soto Windmaster, but even without measuring, I'm pretty sure it's smaller than either, and it's certainly smaller than the Windmaster which is considerably taller. It comes with a little stuff sack and of course a set of instructions. It's roughly as wide as my hand. I measure the stove at about 3.5 inches tall (roughly 9 cm) from the base to the tip of the pot supports. Now, the thing that Soto has caught a lot of flak for is their pot supports. Soto makes good stoves, perhaps the best engineering and the best manufacturing quality currently available (at least in the US market with which I am familiar), but people have not liked the ergonomics of Soto's pot supports. On Soto's first canister stove in the US market, the Microregulator, the pot supports were a little floppy. You'd rotate them into place, but if you moved the stove or bumped it with a pot, the pot supports would flop back down. It wasn't a complete design disaster, but it was kind of a hassle, and people complained. On their second entry, the Windmaster, they had two interchangeable pot supports, a small one that came with the stove, and a large one for bigger pots that was purchased separately. When in place, they were solid, but you took the supports off to pack up the stove. The smaller of the two supports was a dull grayish color, and was easily lost. It never bothered me. I always used an ultralight mini carabiner and clipped the pot support to the valve handle the minute I took the supports off the stove. But apparently a lot of people lost the little clip on pot support, which basically rendered the stove unusable – there was nothing to hold up the pot. So, now Soto's third entry, the Amicus. I think they've got it right this time. The pot supports rotate into place but there's a little hook on the outer rim of the burner. On the pot support there is a little hole. One rotates the spring loaded pot support into place, and after the pot support passes the little hook, the spring pulls the support to the right, seating it on the support. It's actually a very smart piece of engineering. Once in place, the pot supports do *not* come undone. And though they're fairly thin, they have some sophisticated reinforcing designed into their shape. Just yanking them by hand, they feel really solid. These supports are way more solid that the pot supports on the MSR Pocket Rocket, and the Pocket Rocket has done very well for legions of hikers over time. I said it at the beginning of this post, but it bears repeating: No one, and I mean no one, is doing the kind of sophisticated engineering that Soto is doing, and no one is matching Soto's manufacturing precision. That's not to say that other stoves aren't doing some pretty advanced things, but no one matches Soto's amazing attention to detail in both design and manufacture. Soto is making the highest quality stoves in the US market, hands down. There are four serrated pot supports which when emplaced support a pot well. Soto's first entry, the Microregulator, did fairly well, but the MSRP was $60, placing it at the upper range of upright canister stoves. Soto's second entry, the Windmaster, was lighter and with it's two pot support options, very flexible, but it's MSRP was $70. When one can get a good solid stove like a Snow Peak GigaPower (a classic upright canister stove design) for $40 as well as other similar stoves for about the same price, is the Windmaster really that much better that one would be willing to pay an additional $30 for it? Really? Your stove is worth 175% of a Snow Peak GigaPower or an MSR PocketRocket? I don't think it sold well enough. Soto's third entry, the Amicus, has an MSRP of $40 for the version without the piezoelectric ignition and $45 for the version with the "Stealth" ignition. That's right in the range of the most common upright canister stoves. By the way, the piezoelectric ignition of Soto's upright canister stoves is the best of any stove available in the US Market. It's light, it doesn't jut out and catch on things (the wire runs up through the burner column), and it's freaking reliable. Gone how ever is the regulator valve. Apparently to get the price down the more complicated valve had to go. Now, is this a big loss? Not really. The regulator valve is a good thing, don't get me wrong, but it was so overhyped. People thought that some how the regulator valve would allow one to operate the stove at far lower temperatures than other upright canister stoves. Um, no, not really. While nice, the relative pressure in the canister is a function of the percentages of the various component gases in the fuel mix (propane, isobutane, and "plain" butane), the elevation above sea level, and the temperature. A valve holds back the pressure and can only adjust for pressure drops if and only if there is additional pressure available in the canister. I guess what I'm saying here is that it's not a big sacrifice to give up the regulator valve. Most people would not be able to tell the difference between a stove with a regulator valve vs. one with a conventional needle valve. Incidentally, almost all of the popular upright canister stoves have a conventional needle valve, and they've done just fine for years. So, like I say, no big sacrifice here. Will it sell? We shall see. How good is it? Well, check back in a few weeks; I hope to have my evaluation done by mid-December. I'm in the process of reviewing the Hydra stove from Kovea. My review will be featured next week on SectionHiker.com, a popular hiking and backpacking blog. In the mean time, I thought I'd post a sort of "first look" at the Hydra and include some things that will supplement my full review. When my review is ready, I'll post a link here on my blog. The Hydra comes as a nice, complete set that includes a fuel pump, fuel bottle, repair tool, heat reflector, windscreen, spare parts/repair kit, plastic hard case, a canister stand for inverted use, a fuel bottle bag, and of course the burner. Many stoves are sold without a fuel bottle, so it's a nice feature to have a fuel bottle included with the Hydra. A Kovea Hydra boxed set. The bottle bag is a kind of interesting thing. I haven't seen this with other stoves. Most people carry the pump in the bottle when out on the trail. The stove bag protects the pump while in transport. I think this is a good idea. The bag is sized for the included bottle. You can put taller bottles in the bag, but they will stick out a bit. Inasmuch as the pump is what really needs the protection, I suppose one could simply slip the bag on over the top leaving the bottom of the fuel bottle exposed. The pump will stick out of the bottle bag when used with taller fuel bottles. The Hydra has three claims to fame: It's quiet, it's compact, and it works with either canister gas or white gasoline without needing any hardware changes or adjustments. And compact it is indeed. There are very few white gasoline type stoves that will fold up this small and fit in my hand. The Hydra is smaller than a 110g sized canister of gas. The Kovea Hydra is a study in compactness. While it is indeed compact when it is folded, the Hydra expands out with impressively wide pot supports that can handle some pretty big pots, up to about 5 L, possibly more. The Kovea Hydra with the pot supports fully deployed. It can also support pots down to as small as 500 or so ml. A 550 ml mug type pot on the Kovea Hydra. Note how wide the pot supports are. True to its claims, the Hydra really is a quiet stove. It's not as quiet as a non-pressurized alcohol stove, but for a canister gas/white gas stove, it's pretty quiet. The secret is the way that fuel is distributed and dispersed through multiple slits on the burner's periphery. I don't believe I've seen a burner head like this before. The very quiet slit burner of the Kovea Hydra. In my testing, the burner was quiet with both canister and white gas, and the transition between the two required no changes to the burner other than to swap out the fuels. Both modes, canister gas and white gas, worked very well. On high, the burner did make more noise, but for a stove that is as powerful as the Hydra, it really is quiet. The Kovea Hydra on high. I'm not sure that I would describe the Hydra as a gourmet cook's stove, but I was able to get a workable simmer out of the stove. The Hydra doesn't have a precisely controlled flame, but if you monkey with it a bit with moderate to low pressure in the tank, you can get a reasonable simmer. The flame control was sufficient such that I could really simmer my noodles and get them done just the way I like them, with lots of water absorbed. A ramen noodle dish cooked on the Kovea Hydra. So, there's a very brief first look at the Kovea Hydra. There will be more in the full review where I'll go into the results of my testing. Especially important will be the recommendations I make based on wind testing; pay close attention to those. So, what constitutes a good backpacking stove? Well, if you read stove company advertising literature, you might get the impression that boil times are all that matter. While I can understand why stove companies might emphasize something they can put a hard number on, I think there's a bit more to it than that. Below, I'll list my general "framework" for how I evaluate stoves, and then I'll follow that with a brief discussion. A Soto Windmaster outfitted with the larger Four-Flex pot supports. Can it handle the size pot I use? Or is it a top heavy disaster waiting to happen? Can it support my style of cooking? Will it cook well the foods I like to eat? Can I cook in the temperatures and conditions I plan to hike in? Does it work well with the type and size of pots and pans I use? Can it support the different types of trips I like to take? Can it cook for both solo trips and the number of people I usually travel with? Reliability/Robustness – Can I count on this thing? Can it “take a licking and keep on ticking” or do I have to baby it? Weight – How much weight have I got to lug around? Remember that you need to look at your cooking system as a whole. Don't just think about the weight in terms of the burner alone but also consider the fuel, the fuel container (steel? plastic? aluminum? ), pump (if any), and any other necessary items. Price – Do I have mortgage my home to afford this thing? It's generally a good idea to set a budget for yourself before you get your heart set on a stove only to find out that you can't afford it. Stability – Will it dump my dinner? Is the whole assembly "tippy?" Efficiency (i.e. fuel economy) – Is this thing a gas guzzler? Or can I cook all week on a single tank of fuel? Windproofness – Can I cook in real world conditions? Can I (safely) use a windscreen? How sensitive is this stove to wind? Compactness – How much room does the darned thing take in my pack? Will it poke me in the back? Can I carry it in the pot that I typically use? Ease of use – How much fussing around do I have to do to cook with this thing? Ease of maintenance/field repair – If a problem occurs how easily can I fix it? Can I fix it in the field or do I have to send it back to the company? Are tools and spares included with the stove? Speed – How fast is it? Am I still waiting for my water to boil when my friends have already finished eating? Noise – Do I have to buy a hearing aid after using this stove? Fuel considerations (availability/versatility/morality) – How hard is it to get fuel for this stove where I plan to hike? Can I use multiple types of fuels? Is it ethical to use this type of fuel (e.g. wood at high altitudes)? Safety/Legality. Is this type of stove safe and legal where I plan to go? Am I going to start a fire with this thing? Will it flare if it tips over? (Canister gas stoves frequently do) Can the fuel spill if I bump the stove? Does it emit sparks or embers? Can it smolder and come back to life when I'm not expecting it? Can it be easily extinguished? Can I see the flame in broad daylight or am I going to accidentally burn myself in a near-invisible flame? Can the stove be over-primed and thereby cause a fire? Can the valve stick in the open position when I disconnect the stove? The Snow Peak GeoShield will support large pots, but how does it do with small ones? The first three factors one should consider when buying a stove are: suitability, suitability, and suitability. OK, OK, I'm being a little silly here, but seriously, if a stove can't cook foods you like (or are at least willing to eat) or handle the conditions that you will face, then the stove is no good to you, no matter what a high tech wonder it may be. Take a good long look at the things I've written under suitability. These are what your stove must measure up to, and it is these that you must address before you decide on a particular stove. With all of the criteria, these are just things to think about. There isn't a stove that's going to do well by every measure. You must weigh the pros and cons and decide which matter most to you. The frame work is intended to stimulate and guide your thinking as you use your best judgment as to which stove is best for you. Descending from Glen Pass on the John Muir Trail. Looks like it might be a little nippy tonight. How does that stove handle cold? A through hiker might want an itty bitty ultralight stove; they've got to scrimp on every ounce. Hiking day after day is a huge grind on the human body if you're carrying too much weight. A "weekend warrior" hiker who never goes out more than two or three days at a time might prefer a stove that can handle some real cooking. An alpinist who needs to melt snow or he'll have nothing to drink or cook with may want a very powerful stove -- lest he wind up waiting an inordinate amount of time to get water. A Boy Scout might want a larger stove so that he can cook for an entire patrol. A small stove won't be very stable with larger pots. I'm sure you get the picture. The idea here being that you need to think about the length and type of the trip(s) you plan to take, the number of people you typically cook for, the conditions you'll face, and your style of cooking, minimalist, gourmet, or somewhere in between. It is only then that one should start considering the other factors I've listed in my "framework" above. Spend some time thinking through what you want your stove to do for you and what your stove must be capable of handling before you start shopping. The Pacific Crest Trail at about 13,000 feet/4000 meters. Looks a little barren up there. You sure that stove can handle wind? The criteria listed above are how I look at a stove and decide whether or not it's a good stove. As I write evaluations, I try to address these points. However, I can but point out which stoves in a given class are good ones. You, the reader, must ultimately decide which class of stove is suitable for you and then from that class, make your pick. I hope this is a helpful framework. Wherever you're headed, make sure your stove is equal to the task.